Im sitting here looking at the Med sea on a calm day and ive always wondered why there are glassy flat patches of water in slightly choppy water. Any ideas? Is it currents perhaps? Might be waste from a nearby sewerage outfall pipe, or polluted water pumped into the sea by a ship after cleaning its tanks. Since it's the Med probably the former. Or maybe there is some seaweed just below the surface. I saw it happen the other day. A fisherman dumped a bucket load of fish scraps on the waters edge. A light wind was blowing off shore. The water had a slight ripple. A calm dead patch with no wind ripples almost mirror appeared down wind of the fish scraps. And over the next 15 minutes extended 50m down wind. With wind ripples either side of the fish oil slick. Wind was around 5knots. Most likely it is just spots where there is even less wind (or none). A usual sight on calm days. I doubt environmental issues play a role in what you describe. However, the (vague) description certainly gives plenty of options. Try to get as high as possible (tower, hill, etc.) and take a look or (if you would like further analysis) a picture. You "doubt" based on what evidence? 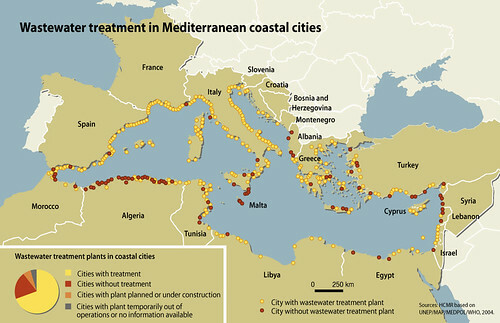 Here's a map of the Med for for you. Note that when waste water exceeds treatment plants capacity excess waste is pumped directly into the sea. Im not ruling that out but I see these flat calm patches too often for it to be sewage pollution and i usually know the area and if there are any sewage outlets around. Surface tension and current. If you have 1/4 knot of current and 2-3 knots of breeze and they're in roughly the same direction, they'll more or less cancel out and leave flat spots on the water.